In any situation, the best decision isn’t guaranteed to work out, and even terrible decisions can sometimes turn out to be the right ones. So when things go wrong, who do we blame and why? And what about when things go right? 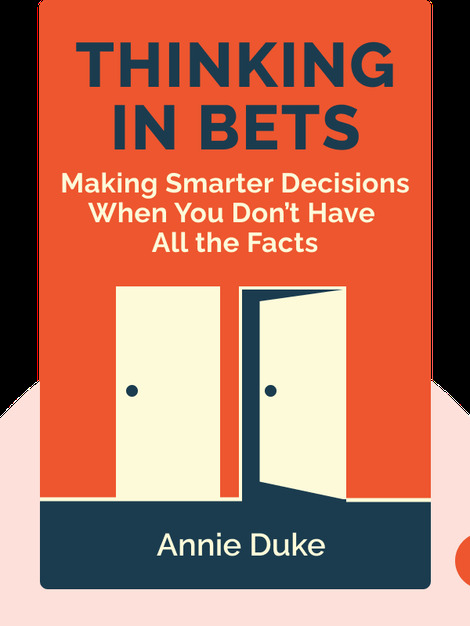 In Thinking In Bets: Making Smarter Decisions When You Don’t Have All the Facts (2018), poker champion, author and business consultant Annie Duke shows how our addiction to outcomes leads to irrational thinking and the confusion of luck with skill. For over two decades, writer, coach and speaker Annie Duke was one of the world’s top poker players. In 2004, she earned a World Series of Poker (WSOP) gold bracelet ahead of 234 other players, and in 2010 she won the WSOP Tournament of Champions and the NBC National Heads-Up Poker Championship. 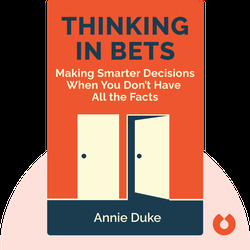 Duke holds a master’s degree in cognitive psychology from the University of Pennsylvania, where she also completed her doctoral coursework before beginning her career in poker. She currently works as a consultant, speaker and author. Her autobiography, Annie Duke: How I Raised, Folded, Bluffed, Flirted, Cursed, and Won Millions at the World Series of Poker, was published in 2005.